The purpose of this book is to encourage believers on a daily basis to be motivated and inspired knowing that God is going to bring each of us through. Facebook isnt a bad thing. Its the people do on facebook make it bad. I choose to use it as a ministry and touch the hearts of people through what God tells me to say. When I wake up in the morning, I say, Lord what would you have me to say to … us this morning to get us through the day. I do not mind posting regardless of the time. There are some people who goes to work early, therefore, I feel within my heart they nee d the message before going to their job. 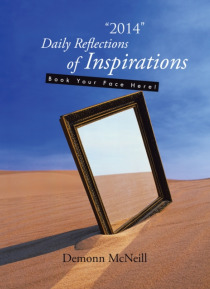 So Book Your Face in this book 365 days for 2014 and allow God to speak to your heart , soul and spirit as you think and reflect on His goodness. If I can touch or help one person along lifes journey then I know that my living will not be in vain.